1992-08-05. New. Ships with Tracking Number! INTERNATIONAL WORLDWIDE Shipping available. Buy with confidence, excellent customer service! Boston: Beacon Press, 1992. Hardcover. Fine/Fine. First edition. Fine in price-clipped else fine dustwrapper. Poet's National Book Award-winning collection. Beacon Press. PAPERBACK. 080706887X signs of little wear on the cover. . Very Good. Beacon Pr. Used - Very Good. Very Good condition. 1992-08-05. Good. Ships with Tracking Number! INTERNATIONAL WORLDWIDE Shipping available. May not contain Access Codes or Supplements. May be ex-library. Shipping & Handling by region. Buy with confidence, excellent customer service! Beacon Pr. Hardcover. 0807068187 slight wear to top edge of dust jacket - minor staining to closed page edge - otherwise cover fine binding strong contents clean - enjoy . Very Good. Beacon Pr. Hardcover. 0807068187 New Condition. . New. Boston:: Beacon Press,, 2005. 0807068861. A Fine tight copy in a Very Good unclipped dust jacket with sunnjing to the spine. This selection contains forty-two new poems with optimistic, clear and lyrical explorations of varying ecosystems, (especially the birds, mammals, ponds and forests of the northeastern U.S.) mingled with rapt self-questioning, consolation and spiritual claims some might call prayers. ..
Boston: Beacon Press, 1992. Very good condition with some minor signs of external wear. From the library of swiss - american - irish poet Chuck Kruger. With his name to half title. Occasional markings and annotations in the text.. Boston, Beacon Press, 1992. 15 cm x 22,5 cm. XII, 255, (2) pages. Original Softcover. Very good condition with some minor signs of external wear. From the library of swiss - american - irish poet Chuck Kruger. With his name to half title. Occasional markings and annotations in the text. Contains among others the following poems: Rain, Spring Azures; Picking Blueberries, Austerlitz, New York, 1957; Her Grave; Goldenrod; The Waterfall; Peonies; This Morning Again It Was in the Dusty Pines; Marengo; Field Near Linden, Alabama; Gannets; Whelks; Alligator Poem; Hawk; Goldfinches; Rice, Poppies etc. Beacon Pr. Hardcover. 0807068187 First Edition, First Printing [1st Edition, 1st Printing]. In a Very Good, mylar-wrapped dust jacket. . Very Good. 1992. First Edition, First Printing [1st Edition, 1st Pr. 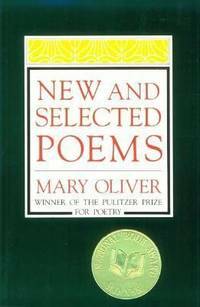 Mary Oliver - New And Selected Poems, Volume One - Paperback. Book. BRAND NEW. BEACON. New. 9.04 x 6.12 cm. Beacon Pr. Hardcover. 0807068187 Like New Condition. . Fine. Boston:: Beacon Press,. Near Fine in Near Fine dust jacket. 2005. Hardcover. 0807068861 . First printing. Small black spot on fore edge, else fine in a near fine (faded along the spine) dust jacket. .
Beacon Press, April 2004. Trade Paperback. New. Beacon Press. Used - Good. Good condition. Volume 2. Slightly dampstained. Beacon Press, 1992-01-01. Paperback. VeryGood. . A nice, crisp copy. Light edge wear may be present due to storage. Covers lay flat, no folds. Pages/covers clean, binding tight. Beacon Press. PAPERBACK. 080706887X Excellent, unmarked copy with little wear and tight binding. We ship in recyclable American-made mailers. 100% money-back guarantee on all orders. . Fine. 2007. Beacon Press. PAPERBACK. B007OLX3WU Like New. Clean, Tight and Neat. Five star seller - Buy with confidence! . Fine. BOSTON: BEACON PRESS. VG IN WRAPS. FAINT WEAR. PAGES CLEAN & TIGHT. Pages: 255. Item #I300351.. 1992. LATER PRINTING. Trade Paperback.. Keyword(s): AMERICAN POETS, POETRY, HOUSE OF LIGHT, WHY I WAKE EARLY. <br><br>You can look for a new and/or eBook copy of this book at <a href=http://www.vintage-books.net/search/apachesolr_search?keys=9780807068779>Our New and eBook site.</a>&nbsp;&nbsp;&nbsp;&nbsp; . Condition: VG IN WRAPS. FAINT WEAR. PAGES CLEAN & TIGHT. Pages: 255. Item #I300351. Beacon Press, 1992-01-01. Paperback. Good. .
Beacon Pr, 1993. Paperback. Good. Disclaimer:A copy that has been read, but remains in clean condition. All pages are intact, and the cover is intact. The spine may show signs of wear. Pages can include limited notes and highlighting, and the copy can include previous owner inscriptions. At ThriftBooks, our motto is: Read More, Spend Less.Dust jacket quality is not guaranteed. Beacon Pr, 1993. Paperback. Very Good. Disclaimer:A copy that has been read, but remains in excellent condition. Pages are intact and are not marred by notes or highlighting, but may contain a neat previous owner name. The spine remains undamaged. At ThriftBooks, our motto is: Read More, Spend Less.Dust jacket quality is not guaranteed.